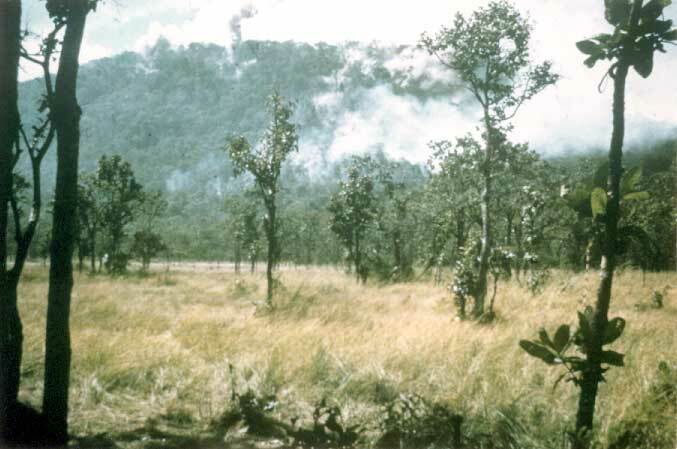 Phase II of the Ia Drang battle did not go well for the PAVN. Under the command of Lt. Col. Nguyen Huu An, North Vietnamese Regulars had planned to ambush troops sent to relieve the Special Forces camp at Plei Me. Events did not go according to plan. You dropped troops close to our headquarters and very close to our units. Our units were broken up, dispersed, and then the Americans dropped into Plei, near the Cambodian border on November third. You destroyed many caches and supplies of food, as well as our hospital. We lost weapons, war materiel, supplies and our communications. When we withdrew you dropped troops to cut off our units. We lost communications with the retreating units. Unknown to the Americans, thousands of PAVN had withdrawn to "Chu Pong Massif." When Lt. Col. Hal Moore received his orders - "Find the enemy and go after him" - he did not have good intelligence to assist him. He did not know that North Vietnamese soldiers were regrouping and resting at Chu Pong Mountain. Of one thing, however, Moore was pretty certain: The 1st Battalion, 7th Cavalry would likely get the "search and destroy" mission to commence on November 14, 1965. Moore, with his men and equipment, would be flown from Plei Me to a pre-selected Landing Zone ("LZ"). Major Bruce Crandall (of the 229th Assault Helicopter Battalion) and his crews would ferry troops and equipment with their UH 1-D "Hueys" and CH-47 "Chinooks." Crandall would fly the lead Huey. His call sign was "Ancient Serpent Six." Most of the guys called him "Snake." All the Landing Zones were in the immediate vicinity of Chu Pong Mountain and the hidden-from-view North Vietnamese soldiers. Bos, Carole "A FAILED AMBUSH" AwesomeStories.com. Feb 01, 2002. Apr 23, 2019.